Description: A deceptive broadside, ostensibly a pro-McClellan campaign piece but actually a piercing attack on the Democratic platform. In the center is a portrait of Democratic presidential candidate George B. McClellan standing aboard a ship, watching the Battle of Malvern Hill–the culminating defeat of his disastrous Peninsular Campaign. (See “The Gunboat Candidate,” no. 1864-17.) 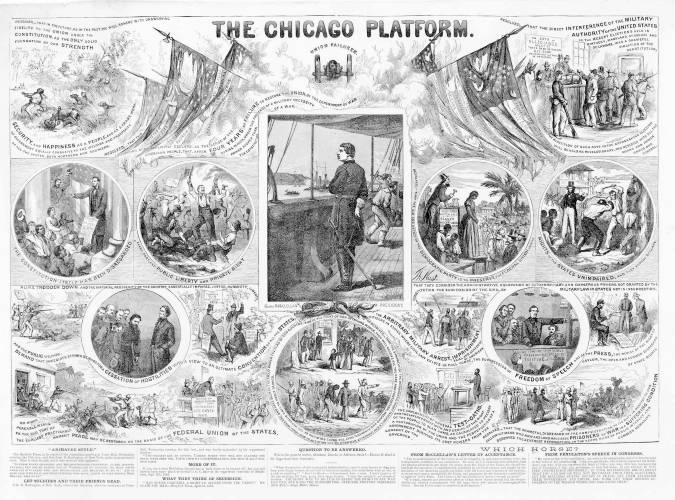 Beneath the print’s title “The Chicago Platform” is a subheading “Union Failures” above a cannon flanked by tattered American flags. Each Democratic platform resolution is illustrated with a vignette which supports its reverse. The top left scene shows a black man chased by bloodhounds, above the tenet “Resolved, that in the future, as in the past, we will adhere with unswerving fidelity to the Union under the Constitution as the only solid foundation of our strength.” At the upper right is a polling scene, above which appears the Democratic resolution condemning the “interference of the military authority of the United States in the recent elections held in Kentucky, Maryland, Missouri, and Delaware.” In the scene balloting proceeds under the protection of federal soldiers. Citizens loyal to the Union vote, while an obviously unruly Irishman is barred. Other scenes are (middle register, left to right): “The Constitution Itself Has Been Disregarded.” Abraham Lincoln displays his Emancipation Proclamation to a group of black men and women. (Continuing from left): “. . . In Every part, and Public Liberty and Private Right.” A picture shows the New York draft riots of 1863, where one man clubs another while a young boy dances. A simian Irishman holds a black child upside down by his foot and is about to strike him with a club. Fires rage in the background. “Resolved That the Aim And Object of the Democratic Party is to Preserve the Federal Union and the Rights of the States Unimpaired . . . . ” One scene shows a black woman sold at a slave auction, and another scene portrays two white men flogging a black man, as an overseer watches approvingly. The bottom register shows scenes of the war, Southern soldiers bowing to President of the Confederacy Jefferson Davis, a Union graveyard, “Rebels in the North” or spies being arrested, and so on. The lengthy text below includes excerpts from McClellan’s letter accepting the Democratic nomination, and from his running mate George Hunt Pendleton’s speech in Congress calling for a reconciliation with the South or the peaceful acceptance of its secession.